efore the Duofold era Parker was just one small pen manufacturer among dozens of others in the USA. The company offered more than 400 models of pens and produced even more. Every pen was hand made and if a customer wanted a custom made pen, well, that was all right with Parker. When the Duofold saw its way into the production line in 1921 it was for the first time appearant that the production line had to be slimmed down to meet the demands of the public for the Big Red. Since it was instantly regarded as a status symbol, it couldn't differ much from the features that sold it: it had to be big, it had to have a large gold nib and it had to be in red. Already in 1922 the number of models offered had been was reduced and only about a hundred fountain pens and forty five pencils were offered. This was also financially sound, since the Duofold sold for $7, while most black pens only cost around $3. n 1923 it was decided, although many at Parker was hesitant, to produce the Duofold also in black. It was clear that this would affect the sales of the Jack Knife pens which it also did, and although the Duofold at this time was a growing family in many sizes and designs Parker was unwilling to lower the price. A cheap Duofold wouldn't continue to be the status symbol it had become. Still, it was clear that the interest in the old Jack Knife safety pens was declining. What to do? In 1924 Parker decided to retire most of the Jack Knife line, leaving only a few sizes, and a new, cheap pen was introduced in black hard rubber, the Parker "DQ". "DQ" stood for "Duofold Quality". A subtle way to capitalise on the Duofold reputation without actually compromising the name. It sold for half the price of the Big Red, $3.50 and had attractive, longitude lines on the pen body. It sported a rolled gold cap band and the hard, rigid manifold nib of the Duofolds. Initially it was produced in two Lady sizes, the shorter version could be found with either a clip or a ring top. Soon the line was broadened, a Junior and a Senior "DQ" was added to the line. Cap bands was also optional. n 1925 the "DQ" imprint disappeared when the line was yet again re-organised. The Jack Knife Safety pens now disappeared all together and the "DQ" model was advertised as the Parker Black and Gold pens. 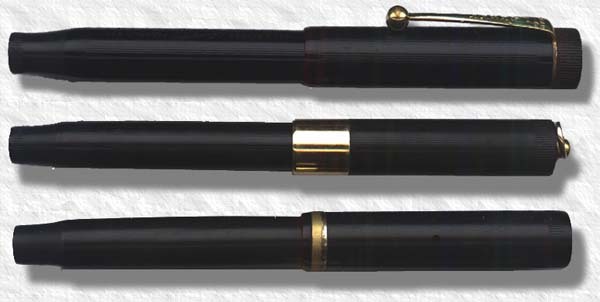 The lined barrels remained, collectors usually refer to all lined pens as the "DQ" ever though the later pens didn't have the additional imprint, "Black Line" is also used to describe the model. The new Black and Gold pens came in six sizes, three with cap bands and three without. the smallest had the #2 nib size. The pens with the nib sizes #3 to #7 also had an additional "X" imprinted next to the number, hence they are sometimes referred to as the Parker X Pens". Top: A 1925 Parker X in plastic, sans cap band with clip. Middle: A 1926 Parker Gold and Black, Lady style in plastic with a broad cap band and a ring top. Bottom: A 1924 black hard rubber Parker "DQ", Junior with one cap band, no clip. t this time Parker was threatened by Sheaffer who had begun to use the new material plastic in their production, allowing for more sturdy pens in other colours than red. To make things even more troublesome Sheaffer had also secured the rights to the new material with the largest manufacturers. Even so Parker managed to sign a contract with the plastic manufacturer DuPont and what better way to try out a new material than in a pen line that was cheap and also was not advertised. Thus the first of the Parker plastic pens, made from a material called pyroxylin (later referred to as "permanite"), was indeed the Black Line pens, marked with an X, Parker X. These of course are very collectible, especially the Senior, but can still be found at very reasonable prices in the collector community. They were also renamed "Raven Black and Gold". Hence the collectors today usually refer to the lined black and gold pens as the "DQ" and the smooth ones as the "Raven". The Ravens were also streamlined, again following the Duofold design. In 1932 the Black and Gold pens was yet again redesigned. They again sported the "DQ" lines and all had a thin gold band, replacing the earlier models. discontinued and two other models were introduced to capture the low-end markets. The Parkette and the Challenger. Both models featured in other colours than black.